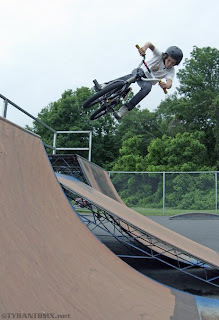 There was an article in The Hartford Courant today about the Canton Skatepark and how the town wants to close it due to vandalism and people not following the rules...the helmet rule being the biggest one! READ HERE. Arnwine, Crabb, Ry Howard, and I used to ride Canton a lot back in the day and it's a fun little park. It totally bums me out to see how ungrateful and disrespectful local kids can be at their own park, especially when their actions are putting the park at risk of closing. It's been 2 years since I've been to Canton, but it looks like I'm going to be headed there very soon. Gotta' get in a final session before it's gone for good!